Bai Chay (Bãi Cháy) Beach is known as a coastal town and it is about 100 kilometers northeast of Hanoi. Every year, it attracts a huge number of beachgoers, including Halong people and tourists, especially in the summertime. Bai Chay is the closest beach to the Ha Long Bay. 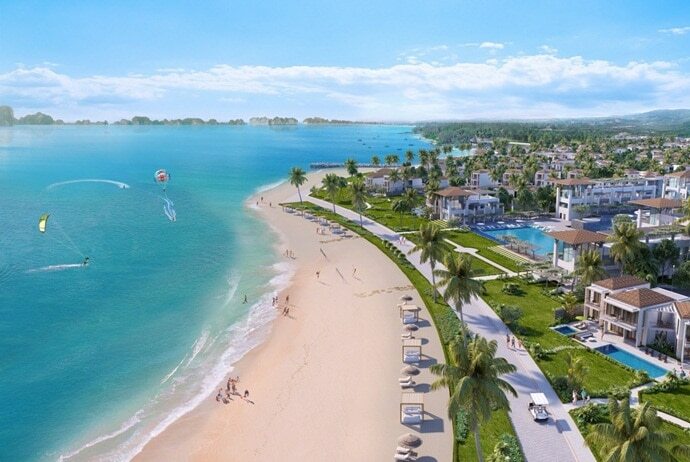 So, there are also many resorts, hotels as well as seafood restaurants here. 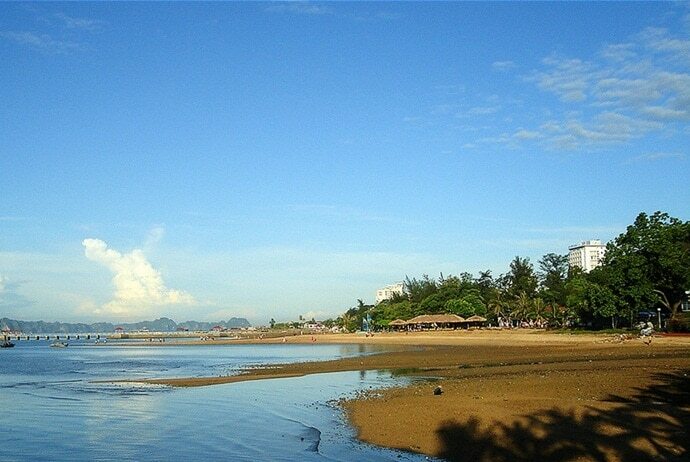 Besides, Bai Chay Beach fascinates many travelers thanks to its cheap cost and good tourism service. So, if you have a chance to travel to Vietnam this summer, you can consider discovering Bai Chay Beach in Quang Ninh – an amazing tourist destination. In this article, Vina.com will expose some important things and experiences that tourists may need to know before going to Bai Chay Beach. 1. How To Go To Bai Chay Beach? There are a few different ways to go to Bai Chay Beach in Vietnam. Depending on your schedule, time and distance, you can choose the convenient transportation. Some transportation ways to Bai Chay that tourists can choose include bus, train, and motorcycle. From Hanoi, if you want to go to Quang Ninh (Quảng Ninh), you can go to Luong Yen (Lương Yên), My Dinh (Mỹ Đình) bus station. The tickets are about 100,000 VND / person. It takes about 5-10 minutes to have a trip. Also, the train is a means of transportation that many travelers love. Actually, it is relatively easy to travel by train as it is very safe and comfortable. You can find Halong Express train with ease that departs from Gia Lam (Gia Lâm) Station. It takes about 10- 15 minutes to have a trip. Ticket price is about 100,000 VND / person with seat. 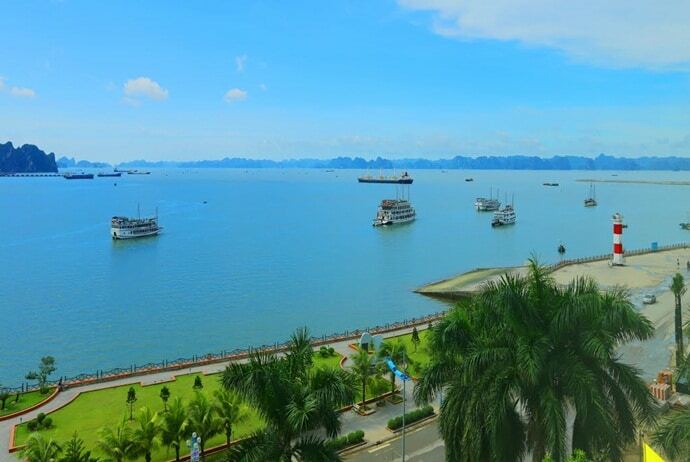 From Hanoi to Ha Long, you can choose either of the following routes in order to choose the most suitable route. Firstly, from Hanoi to Sai Dong (Sài Đồng), turn to Bac Ninh (Bắc Ninh), and then go to Pha Lai (Phả Lại)- Dong Trieu (Đông Triều) – Ha Long (Hạ Long). Secondly, from Noi Bai (Nội Bài) Airport, turn to Bac Ninh – National Highway 18A and then go to Pha Lai – Dong Trieu – Ha Long. The total distance is about 140 – 160 km, and you need to prepare carefully before going and move safely in order to ensure safety for everyone. 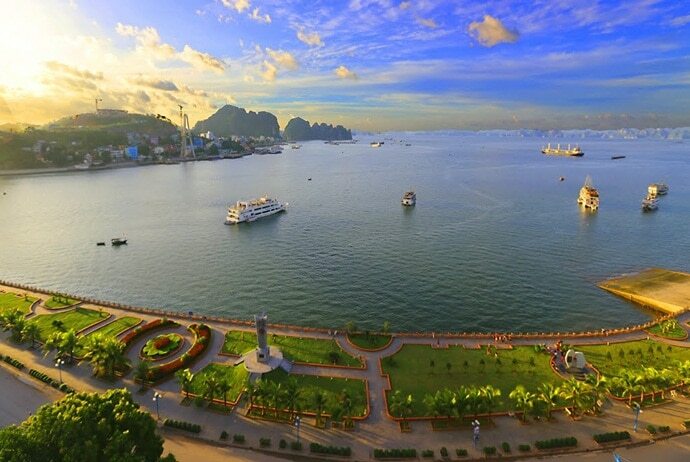 When speaking of Quang Ninh (Quảng Ninh), most of the people think of Ha Long Bay. Nonetheless, you should not miss beautiful tourist destination called Bai Chay. This beach has a few unique characteristics that can attract a lot of tourists. Its width is about 100m and its length is more than 500m. The topography is a low hill that runs to the sea and it has many resorts to relax and enjoy summer. People love Bai Chay beach in Quang Ninh because it is a large and beautiful beach and it has white and smooth sand and clear water. This attracts many tourists from all over the world to come. In the early morning or in late afternoon, many people come here to enjoy the atmosphere here. There are a few legends related to the name Bai Chay. One of these legends is that when the food-carrying fleet for the Yuan-Mongolian invaders came there, the Vietnamese locals under Tran Khanh Du’s leadership set fire to it. And, the whole fleet was burned. At the same time, the northeast wind blew hard and then added fuel to it. Then, it burned down the forest that is located in the western side of Cua Luc (Cửa Lục). As a result, it is called Bai Chay. Another legend is associated with the western side of Cua Luc that was a wharf for boats. Barnacles attached to the sides of these boats might wreck the boats. Therefore, the locals had to burn these acorn-barnacles by using casuarina leaves. From Hon Gai (Hòn Gai) as well as other neighboring places, people often saw a blaze from there, so it is called Bai Chay. Learn More: Bai Sao Beach – Is It Really The Best Beach On Phu Quoc Island, Vietnam? When it comes to learning what to do in Bai Chay Beach in Vietnam, you should not ignore that this beach has a long sandbank. Therefore, you can walk along the sandbank, swim in the clean water and take a sunbath. Apart from swimming, there are some other activities for you to choose from, such as surfing, jet skiing and canoeing. If you are looking for some sightseeing, you can find some historical landmarks in the town. 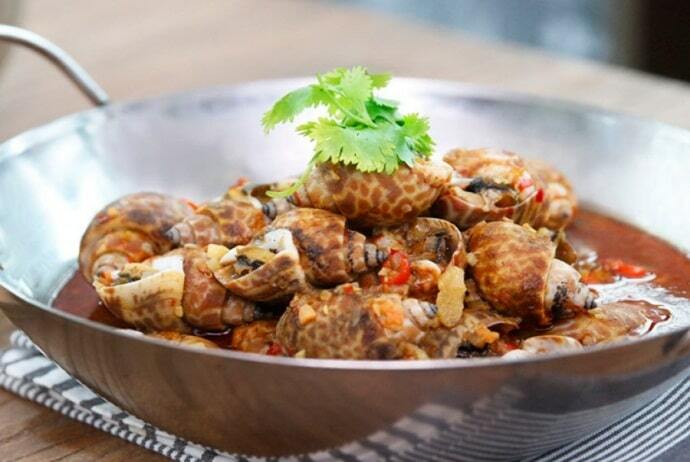 The famous dishes in Bai Chay Beach in Quang Ninh are fried snails, clams, grilled oysters, baked oysters and fresh squid. Oysters grilled on the charcoal stove with lemon wedges and cold beer is an irresistible attraction. Most of the restaurants here have specialty, but the prices are also different. So, you should ask the price before choosing anything. Also, people who have a history of allergy to seafood should not eat seafood to prevent allergies or abdominal pain. Before you eat at any restaurant, choose carefully. It is a restaurant with open air, nice view, and convenient parking. 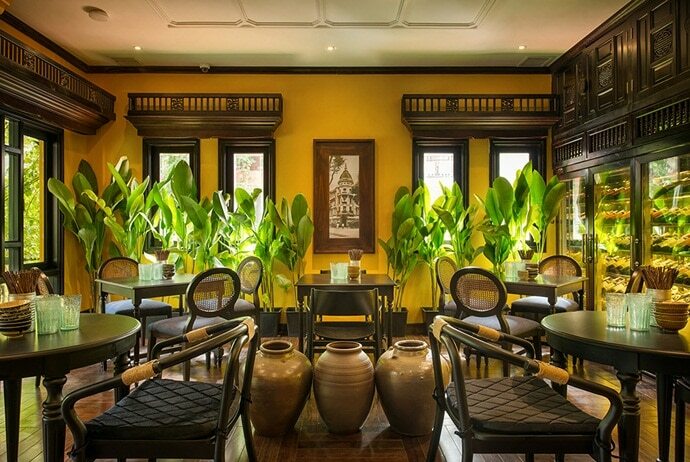 Besides, with luxurious space and good service, this restaurant promises to bring satisfaction to travellers when visiting. This restaurant is very convenient because it is located right at the beach. Apart from delicious foods, the restaurant also attracts tourists with its ethnic musical performances. This restaurant has elegant architecture and it specializes in providing fresh seafood. This restaurant is also great with the extensive campus. This restaurant offers many delicious dishes with affordable prices and good service. It specializes in seafood and the staff here is very enthusiastic. Now, if you want to know more about things you should know before travelling Bai Chay Beach in Quang Ninh, you should continue to read the rest of this article. 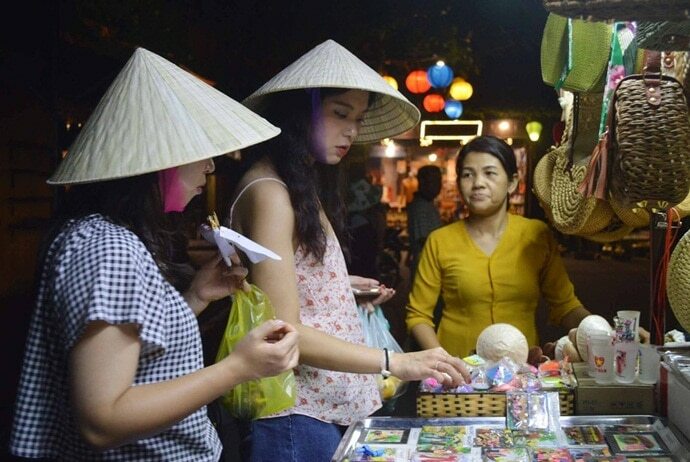 Shopping is characterized by the Vietnamese tradition, so you should not miss Bai Chay night market. Situated on the coastline of Bai Chay, Bai Chay Night Market is open from 18:00 to 22:30 on a daily basis. Every day, it welcomes from 5,000 to 7,000 visitors who come to visit and shop. You can buy seafood at this market and use it as a gift. You can also find many stalls that sell handicrafts, clothes and jewellery. You need to do bargain hard because prices are higher for tourists. It makes sense for you to offer half of what the sellers quote initially. In case they do not agree, you can try walking ahead to some other shops. The sellers will be able to call you back and accept your suggested price. Every summer, with the attractive colors that travellers bring to the market, Bai Chay night market becomes an address that people should not miss when they visit this beautiful coastal city. Actually, this night market is a great place for tourists after a day of bathing and walking. The Hoang Gia Tourism Company has had many services for tourists. It comprises Hoang Gia (Hoàng Gia) Park, restaurants, water puppet, music theater, etc. The Hoang Gia Park is a large colonial mansion located on Bai Chay Beach. It has the Vietnam Cultural Theatre that holds traditional music and dances every evening. Shows are held at 19:30, 20:45 and 21:45. Therefore, if you want to know more about Vietnam’s history, you should visit the Antique Museum that has a collection of artifacts. It includes two tombs from the So and Han dynasties. 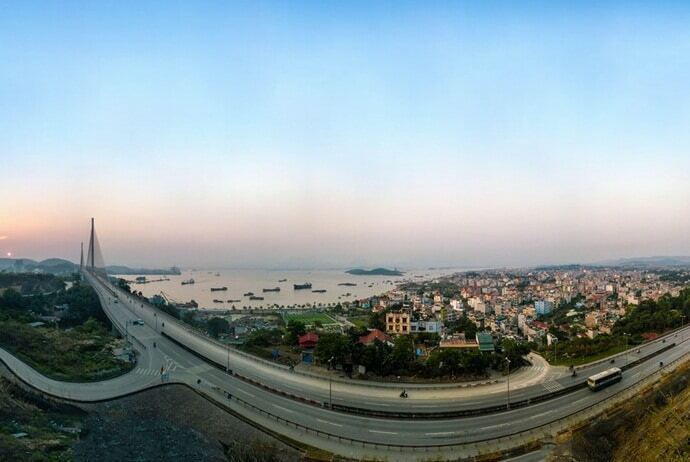 The length Of Bai Chay Bridge is about 1,106 m and this bridge helps to connect Bai Chay and Hon Gai (Hòn Gai), which are two parts of Ha Long City. Especially, the bridge also illustrates the characteristic and development of the people here. The width of the bridge is about 25.3 m and divided into 6 lanes. 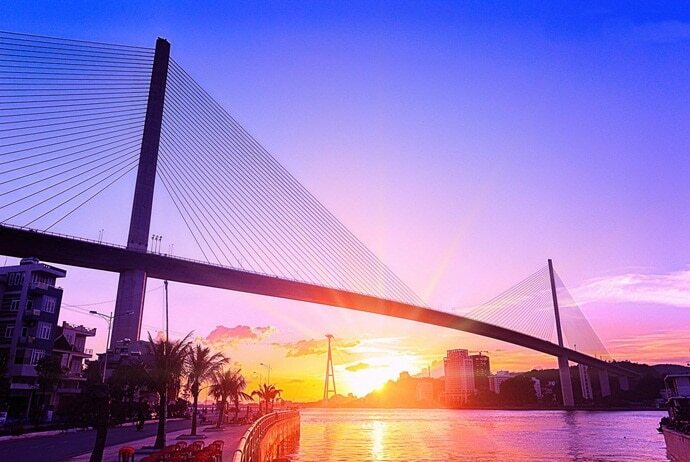 Besides, the bridge also has a beautiful geographic location, so many tourists use it as an ideal destination for sightseeing. Just stand on the bridge and you can enjoy breathtaking overview. Hopefully, you can have a great experience in Bai Chay Beach. Visit Bai Chay Beach and do fun activities here. 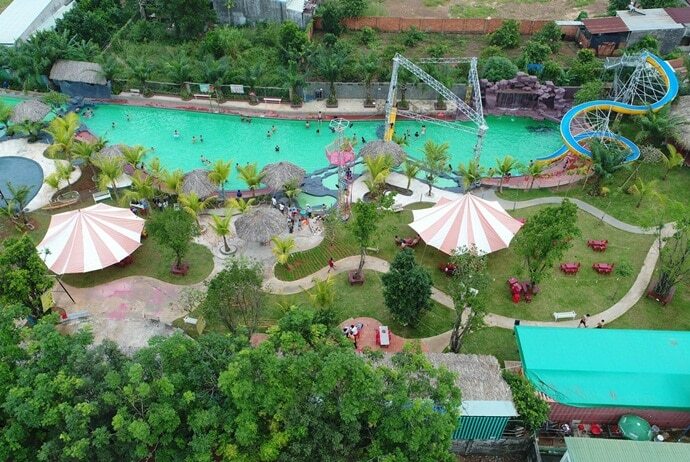 All of these Bai Chay’s attractions will surely not disappoint you and give you an unforgettable experience for you. Halong nightlife guide – what activities for tourists to join in?